CHICAGO--(BUSINESS WIRE)-- Hyatt Hotels Corporation (NYSE: H) announced today the official opening of Andaz Ottawa ByWard Market, marking the brand’s official entry into Canada. Andaz Ottawa ByWard Market will further the brand’s mission to create inspiring, indigenous experiences that immerse guests in the local culture of each unique destination. The hotel, which is the thirteenth in the portfolio, joins other Andaz hotels in global gateway cities and top resort destinations. Three other Andaz hotels plan to join the portfolio by the end of 2016, including Andaz Scottsdale Resort & Spa, Andaz Delhi and Andaz Mayakoba Resort Riviera Maya. Set in the heart of ByWard Market, a historical marketplace and present-day urban center of chic boutiques, galleries, restaurants and nightlife, the capital’s newest hotel boasts 200 contemporary guest rooms, six inspired studio meeting spaces, a ground floor restaurant and bar, as well as a stunning rooftop lounge, offering sweeping views of the Ottawa cityscape. 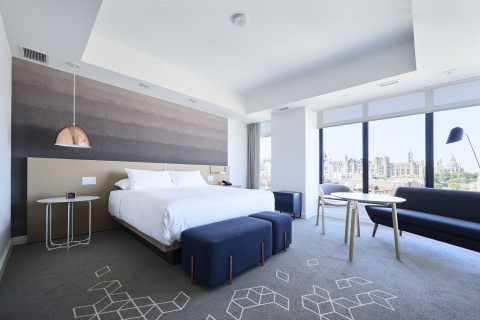 Andaz Ottawa ByWard Market worked with award-winning interior design firm Mason Studio to bring the hotel’s local vision to life. Each floor of the 16-story hotel reflects the history and character of a Canadian province or territory. Upon entering the space, guests are welcomed into an inviting lounge environment with custom-designed low sectional seating. Overhead, Mason Studio enlisted the expertise of Toronto-based furniture makers Hollis + Morris to create a lighting installation made of mixed Canadian-wood species. Patterned rugs and copper metal accents provide pops of color and texture against the understated lobby, clad in natural, local materials such as oak paneling and grey stone floors. Artwork throughout the hotel gives a nod to its surrounding culture and has been curated by the Canadian Council Art Bank, home to the largest collection of contemporary Canadian art. Helmed by Executive Chef Stephen La Salle (formerly of The Albion Rooms), Andaz Ottawa ByWard Market boasts multiple dining venues that are richly Canadian in atmosphere and pan-Canadian in flavor. The hotel’s signature restaurant, feast + revel, is built around the incredible view surrounding its exterior, extending throughout the ByWard Market. Inspired by its environment, feast + revel features New Canadian cuisine with an ingredient-driven menu emphasizing local, organic, hormone-free and sustainable products. An all-day coffee bar with grab-and-go bites and high quality, locally sourced Equator coffee is available for both guests and the neighboring community. Copper Spirits & Sights, the hotel’s 16th floor rooftop bar and lounge with incredible city views and open fire pits, offers a craft cocktail and beer program that reflects the seasons, as well as curated small plates made for sharing. The commitment to embracing and incorporating Canadian aspects into the heart of Andaz Ottawa ByWard Market can also be seen through the hotel’s complimentary and locally sourced minibar items, including Tawse Wines (2016 Canadian Winery of the Year), Hummingbird Chocolate (winner of the “Golden Bean” Award for best bean-to-bar chocolate in the world), Walter Caesar Mix, Harvey & Vern’s sodas, Purple Urchin and HoneyBars, amongst others. Andaz Ottawa ByWard Market offers spacious studio spaces and lounges that create a customizable backdrop for a variety of events and functions. Spanning 4,500 square feet of flexible function space, the natural light and creative dining and drink menus make the spaces ideal for meetings and intimate social functions. In keeping with the interior design of the hotel, the studio space furniture features modern detailing and a neutral palette. One of the most distinctive features of Andaz Ottawa ByWard Market will be the hotel’s collaboration with local artists, musicians, designers and more to create events and programs for guests based upon themes unique to Ottawa. The Andaz Salon, the brand’s signature program, is designed to trigger curiosity and spark a new understanding or unexpected connection to local culture and experiences. The distinctive spaces at Andaz Ottawa ByWard Market will be stages for creative Andaz Salon events, ranging from talks and lectures to exhibitions and live performances. These events can also be experienced through the Andaz Salon website at http://andazsalon.com/. Andaz Ottawa ByWard Market is located at 325 Dalhousie Street. For more information or to make a reservation, please visit: ottawa.andaz.hyatt.com. Located in the heart of Ottawa’s famed ByWard Market neighborhood, this locally inspired boutique hotel features design-forward interiors reflecting Ottawa’s heritage, art pieces curated by the Canada Council Art Bank and locally sourced amenities in each of the 200 rooms. Food and beverage offerings are handled by Executive Chef and Ottawa local Stephen LaSalle, overseeing restaurants highlighting Canadian ingredients and cuisine. For more information, please visit ottawa.andaz.hyatt.com. You can also find Andaz Ottawa on Twitter and Instagram. Global in scale while local in perspective, Andaz hotels weave the sights, sounds and tastes of their surroundings into each property for an experience that truly immerses guests in the eclectic culture of each local destination. Through personalized, unscripted service, Andaz hotels creates a barrier-free environment where guests are encouraged to explore their personal sense of style and become inspired by the spirit of the community. Thirteen Andaz hotels are currently open: Andaz 5th Avenue and Andaz Wall Street in New York, Andaz San Diego, Andaz West Hollywood, Andaz Napa, Andaz Savannah, Andaz Maui at Wailea, Andaz Peninsula Papagayo in Costa Rica, Andaz Ottawa ByWard Market, Andaz London Liverpool Street, Andaz Amsterdam Prinsengracht, Andaz Xintiandi in Shanghai and Andaz Tokyo Toranomon Hills. Head to Andaz Salon to see evocative content from Cultural Insiders, unique events and stunning photos that bring to life the creative spirit and local influences of the Andaz brand. For more information, please visit http://www.andaz.com/. You can also find the Andaz brand on Facebook, Twitter and Instagram.